This great little flatbread recipe from The New Potato makes an appetizer portion for four individuals, or a single nine inch flatbread pizza. I love these flatbread toppings. You can make your own pizza dough for this one or scroll down to the bottom and peruse the flatbread mixes available on Amazon. I’ve tried several of them and they are excellent, in case you’ve ever wondered where to buy flatbread. I’ve listed my favorites at the bottom of the pave. This flatbread pizza recipe has been modified for use on a bbq grill mat but you can just cook it in your kitchen oven if you prefer. Sufficient amount of flatbread pizza dough, either homemade or store bought, to make a 9″ flatbread pizza. 4 slices of prosciutto – After all, this is an Italian recipe. Gotta have that prosciutto. 1/4 cup pesto – you can also just use fresh basil if you prefer or if you have it on hand. Fresh basil is an awesome flatbread topping. Turn your bbq grill to medium heat. That would be around 350. On a flat surface, roll out the flatbread dough until it is around 1/8″ thick. This will give you very thin flatbread. If you prefer a thicker flatbread, just roll to 1/4″ in thick. Brush both sides with a small amount of olive oil. Or a large amount if that’s what you’re into. Put the dough on your grill mat and grill just the dough for 2-3 min on both sides until nicely marked. You can use the bbq grill mat to cook any flatbread recipe, not just this one. 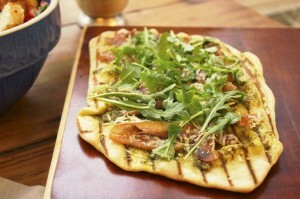 Remove the flatbread from the grill mat, and spread the pesto evenly across the surface of the dough. Layer with prosciutto and Parmesan. Put it back on the grill mat and close the bbq lid for 2 min, or until all cheese is melted. In a bowl, toss the fresh arugula with lemon juice. Once the flatbread pizza is off the grill, sprinkle with the dressed arugula. Serve it immediately for best results. And there’s your flatbread recipe for pizza.